Baby blanket for a friend. All babies are special, but this pregnancy is extra special, as the mom had a stillbirth in 2005, and a miscarriage earlier this year. We met her through a neonatal death support group about a week after she lost her first son. 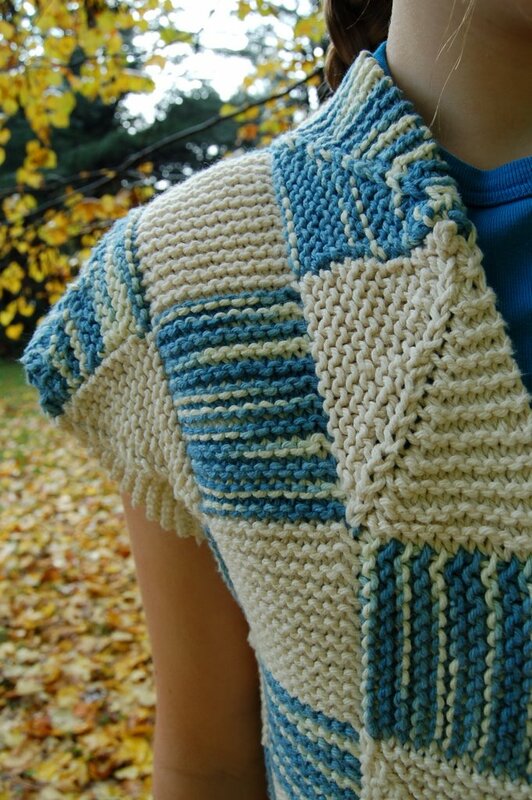 I already had the mult-colored yarn in stash as leftovers from a previous baby sweater. Picked up the yellow and green at my LYS October sale for $3.00 each ball. I don't normally care for acrylic, but the multi-colored is part wool, and all three yarns are SO soft! US 9's. Kindly forgive formatting booboos on this post - I can turn the computer on and off and type, and that's about it :-). Rather shameful at 36 years old...! Also, many thanks to Cristina for her patience in helping me sign up for this blog! So, what do you think??? What would you move around, what do you like? For those of you who have made one, how did you choose to group your squares? Oh, and don't let the pic fool you, it's not a large blanket but it will be 36x54 before the border, a nice baby/lapsized blanket. 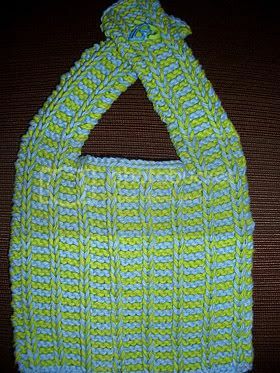 Ok, honestly I had much more grandiose plans but I ran out of steam, and yarn =) It's still lovely and made out of Mission Falls Cotton. Thanks everyone and happy knitting! 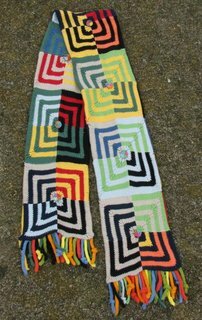 I present Modern Log Cabin Baby Blanket Number Three ~ complete and on it's way to find the baby! And...I procured an elusive photo of Blanket Number One in the wild! Take a peek at how cute it looks with an actual baby on it! 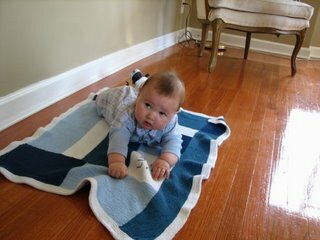 (That's little nephew Luke). For further irrational cuteness, you can click over to my blog. 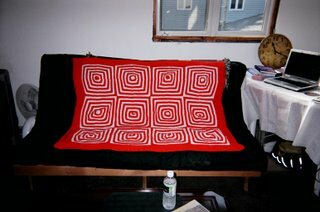 I started this afghan in July and finished it at the end of Sept. It's actually a bright orange and white though it comes across as red. 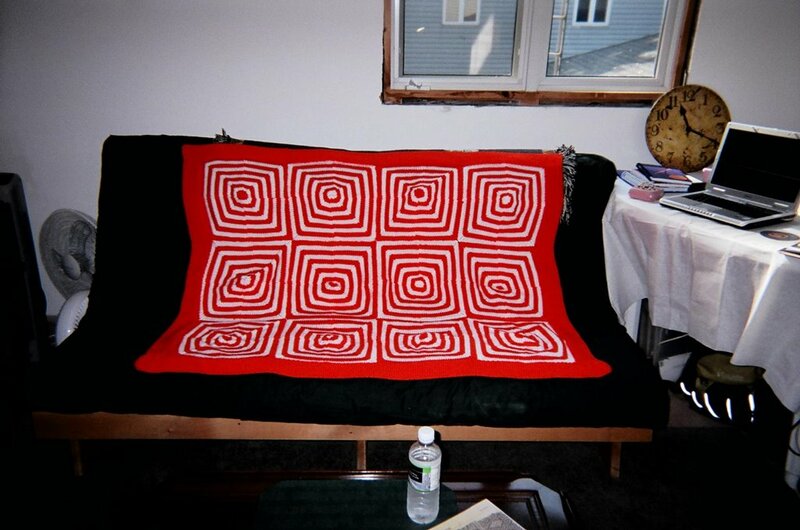 This is the first afghan I've ever knit. 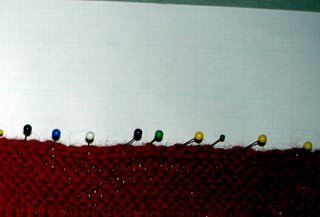 I didn't measure the finished dimensions, but I did do a seed stitch border, about three inches wide. 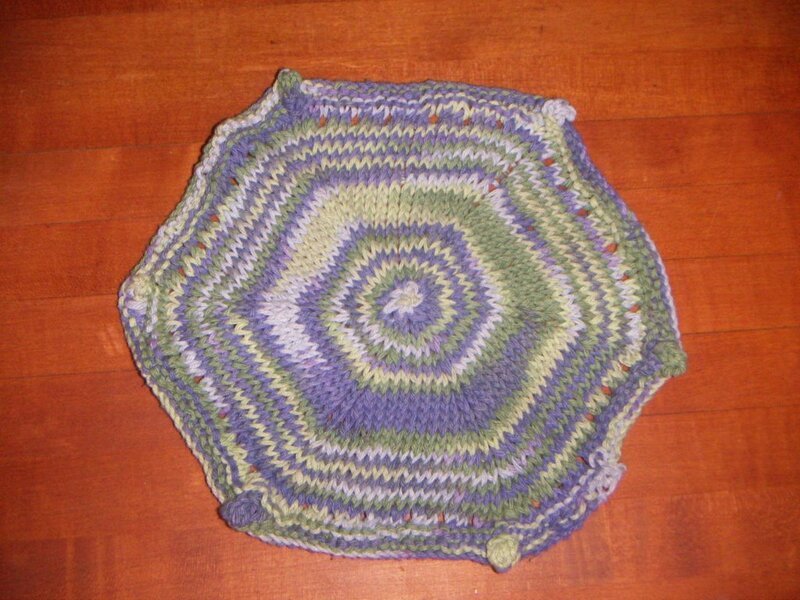 I'm quite happy with how this turned out and will likely do a mitred square afghan again. 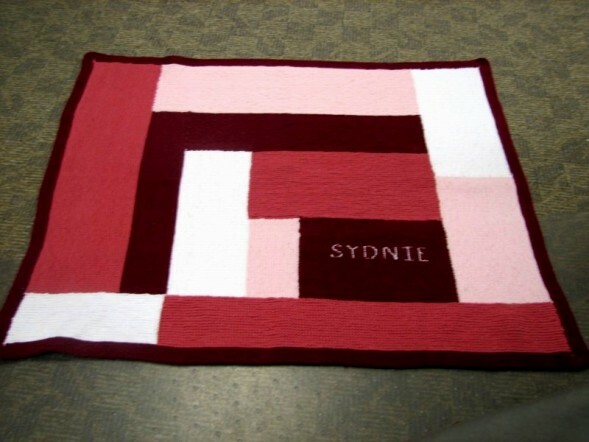 This will be for my neice for Christmas! 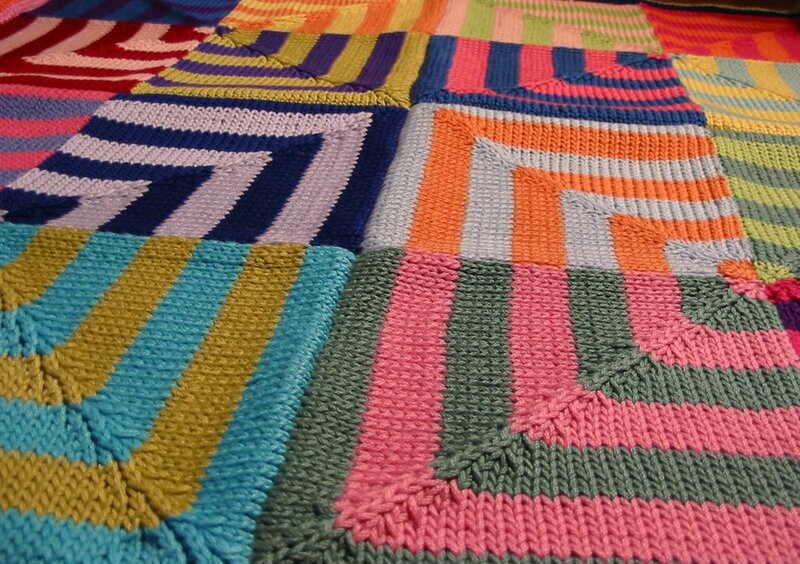 I'm enjoying knitting this blanket using the "Baby genius Burp Cloth" pattern so much that I just had to share it with you even though it's nowhere near completion. For more details please check out my blog. It's called "countryside ombre" & I am smitten! I'm heading to AC Moore in the morning to pick up more for my stash!! In attempt to have a method to my mitered square madness, I've decided to do my latest round of squares in a row from the same ball. 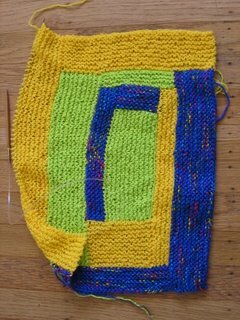 What I mean is: I will knit up an entire skein of one colorway and keep those squares in order as they are knitted up that way I can document how the colorway plays out when it is knitted up. This will also enable me to look back at the colorways and say either: "Oooooh, I love that colorway! That'll make a great______(fill in the blank)" or "Yuck! So not a good colorway. No mas Noro, para mi, por favor!" I got the mitered square baby blanket seamed (thanks again for the help!) and it now has a border. 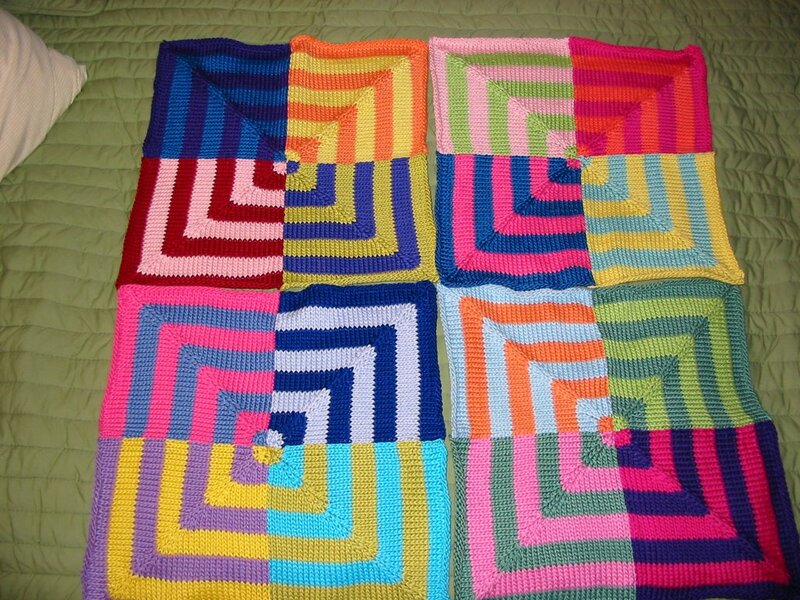 If it was for me, I would have chosen different colors for the border, but I wanted very cheery and fun colors since it's for a baby. There's more details (including a photo of the back seams) on my blog. Now my question is whether or not to add a lining to the back, since it will (hopefully) get a lot of use? Has anyone else added a lining to theirs? 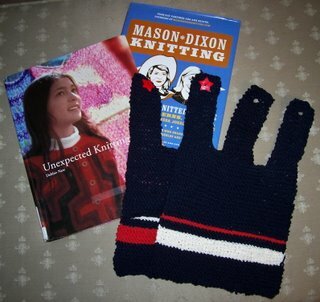 I found this adorable pattern based on the Mason-Dixon ball band warshcloth. 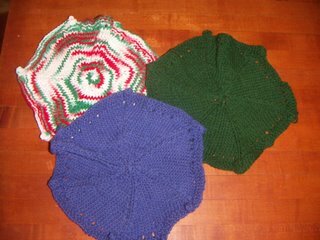 I knitted these up last night using Sugar N'Cream yarn. They are adorable and my two granddaughters (9 and 6) are going to love them! 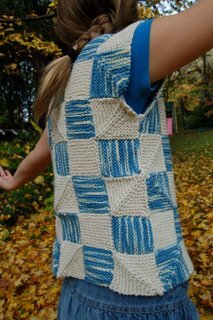 The free pattern is HERE. everyone's projects are just amazing! thank you for sharing with all of us. i just love seeing and reading about what everyone is doing with the wonderful ideas in this book! Knit on my friends! Knit on! 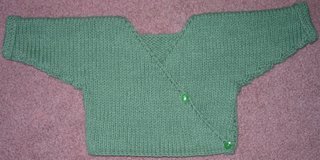 I'm looking for some quick baby knits. For those of you who have knit the baby kimono, about how long did it take you? 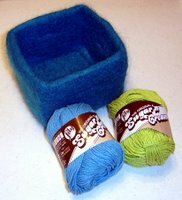 Mega Yarn Sale at Michael's!!! Just wanted to let all of you out there is stash-ville know that Michael's has selected colors of Sugar n' Cream on sale for 50 cents each! Don't go out there and buy it all up, though, because I may be going back! :) Enjoy! Check out the details on my blog. Ciao! SweetBeaker. 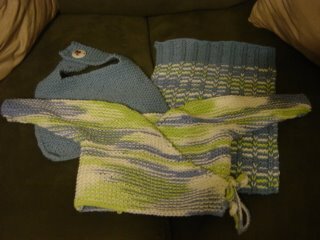 This was knit for my cousin who is expecting her first baby - a boy! The button is a snorkel mask. It was in a pack of tropical-/vacation-themed buttons at Michaels. 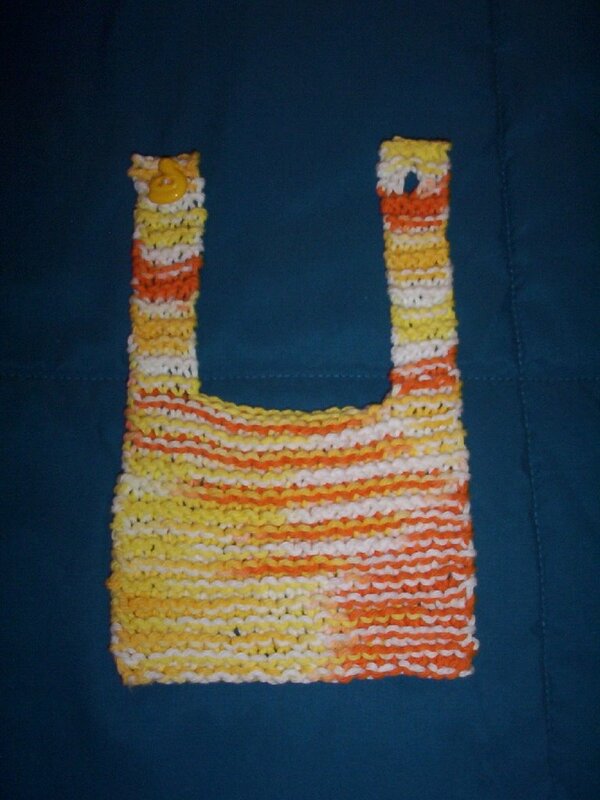 I love that you can make a bunch of these bibs and burp cloths with Sugar 'n Cream. 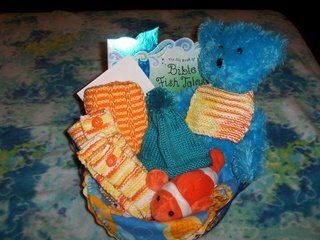 With so many friends having babies, it helps to be able to make special gifts without draining my account. If I can get my Christmas gifts knitted early (ha) maybe I can finish a blanket before her February due date. The back of my kimono looks good, but when I started to decrease at the wrist on the front it does not match up that well. In binding off it looks like steps and the very edge does not match up. Any suggestions? Sorry I can not add a picture. I would also love to hear how you increased the pattern for an older baby. I'm a new knitter, so I really like felting. All the sins seem to get washed away in my front loader. After trying out the process a few times, I decided to take on the MD Buttonhole bag. It would be easy. And I would rock the world. Or so I thought. Ok. I got lazy. I didn't watch the clock. I put it on "hot wash" in my front loader and walked away. I put it on a second time, and walked away. But the third time? Well, come on! I was just asking for it. 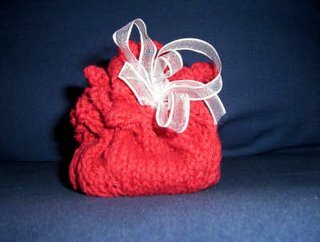 The result was my version of the Buttonhole bag. It's very tight, but still very cute. 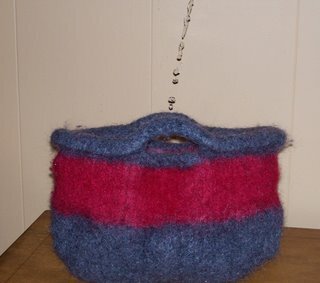 My knitting friends call it "Waterproof." 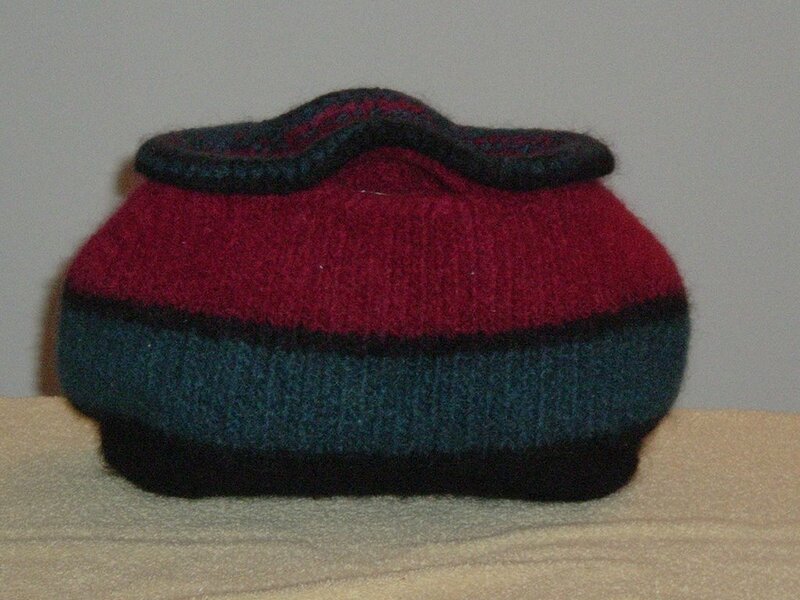 I made my first felted box & the boys BOTH wanted it, so I said I'd make another & the youngest put in his order - lol. So my 7 year old is keeping his knitting in his felted box & my 5 year old is keep his little army men/pirates & hockey players in his - lol. The first box is a solid colour & the next is a variety, every square is different & some change in the middle ... and only two handles!! Funny, Funny, Who's got a Funny? 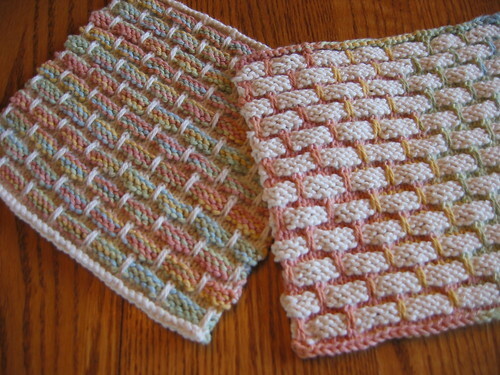 I have been whipping through these dishcloths like they are going out of style. Thus, I have decided to dress as a Knit Wit for Halloween. I need jokes to put all over myself along with yarn and needles in my hair and clothes. 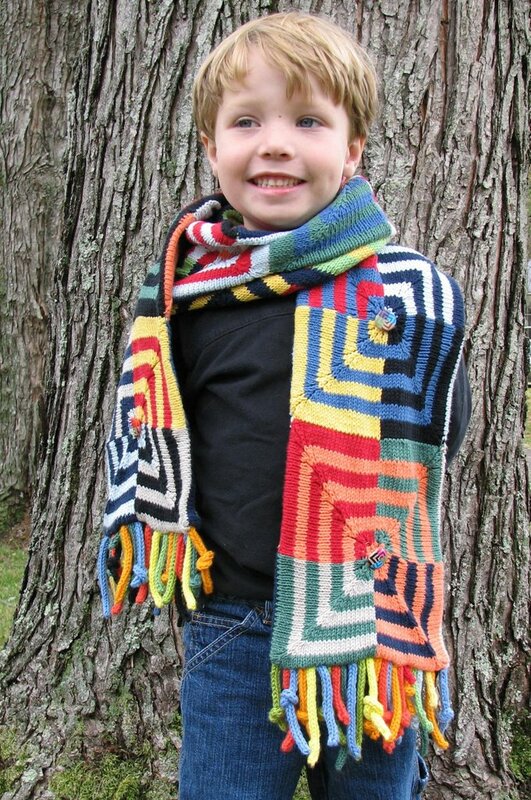 When searching the internet for knitting jokes...I came up short. Someone even said that knitters must not be a funny bunch. I know that is not true! Some of the funniest people I know are knitters! So....got any CLEAN jokes for me to use? I've done the dish rag thing (and have another on the needles now), but a new set of twins inspired me...uhm, gave me the excuse to do these. All roads of inquiry about them lead back to my blog. I have these four "super" squares ready to be seamed into a baby blanket, but I'm unsure of what seaming technique to use. I used mattress stitch to turn the sixteen original squares into super squares, but these seams are top seams ( vvvvvvv ) to ( vvvvvvv) instead of side seams. Can anyone help? I tried to decipher what to do from the pictures in the book, but I failed. I guess I could use fake grafting, but I was hoping to do something invisible. (I did read through the "No Sew" miter entry before posting this, but those don't seem like the answer) Any ideas or URLs for help would be appreciated. Thanks! 10/25 Update: Seams complete, picture to follow once the border is done. Thanks for all of your helpful suggestions! I really enjoyed knitting the ball band washcloth, as I know many of us have. In the MDK book, it mentions Barbara Walker. I went to my local library and checked out her Mosaic Knitting book because I had read somewhere that the slip stitch knitting is what mosaic knitting was all about. 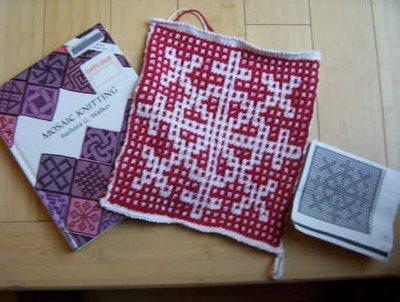 Here's my first attempt at mosaic knitting -a snow flake! I've had the book for awhile now, but all I've managed to make are some ballbands. I've made several of these and given them all away, everyone seems to love them. 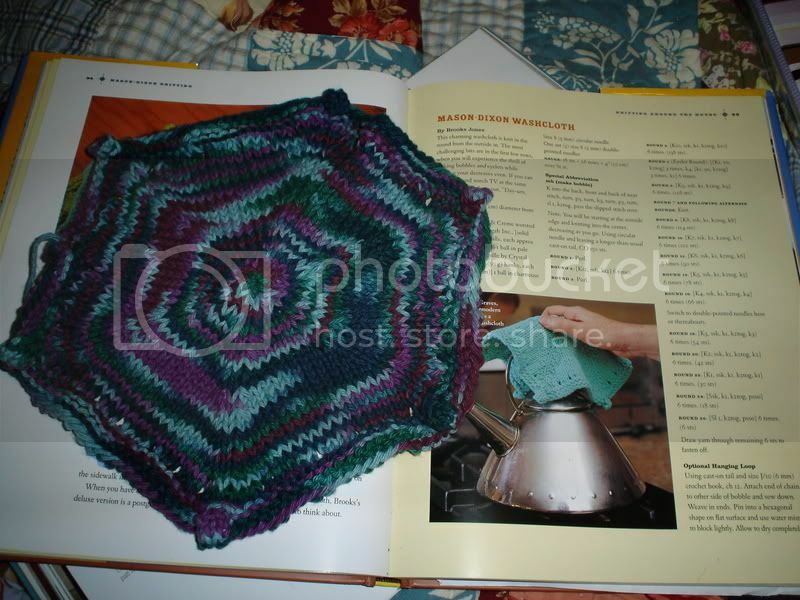 There are many more projects I want to try, and I do have some louet linen yarn waiting to beome a handtowel. These ballbands are sugar n cream in "buttercream" and " ecru." I finally finished my mitered square project that I started in April. 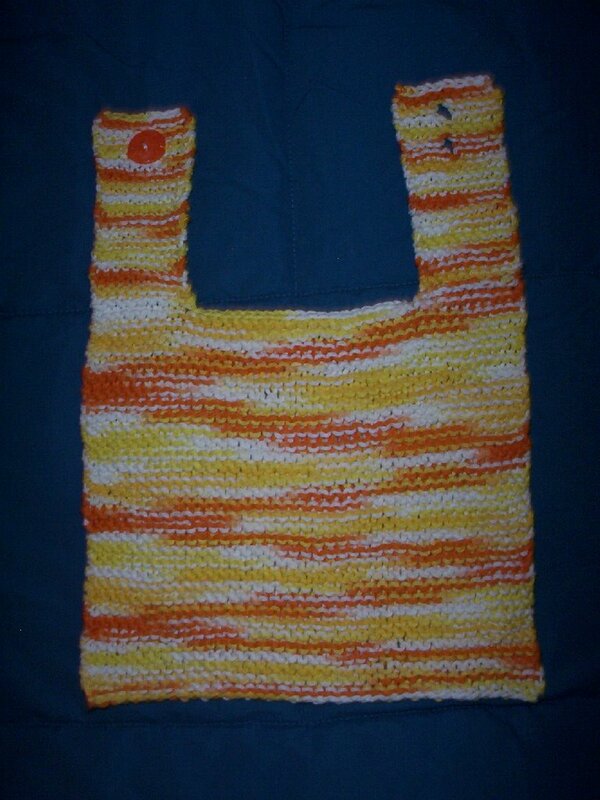 This was my swimming pool/car/soccer practice knitting project. 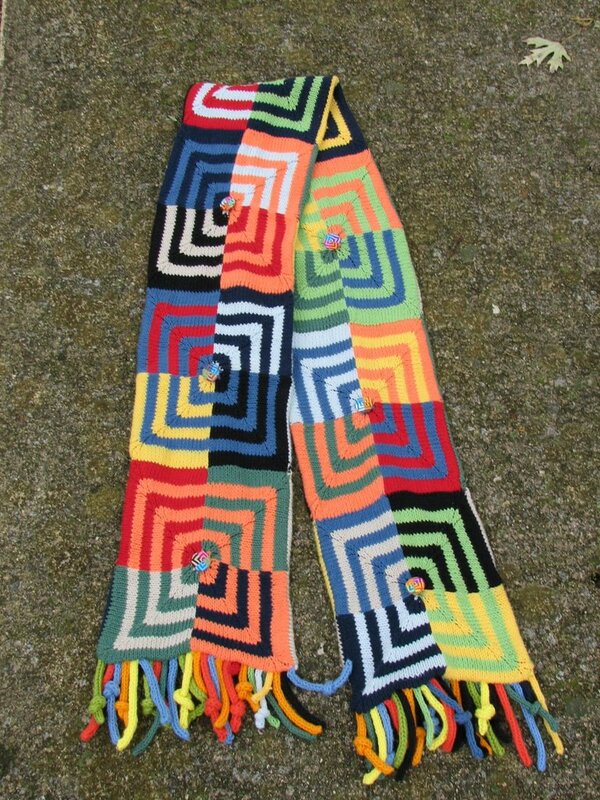 I decided to make it into a scarf. It measures 7 inches X 65 inches. 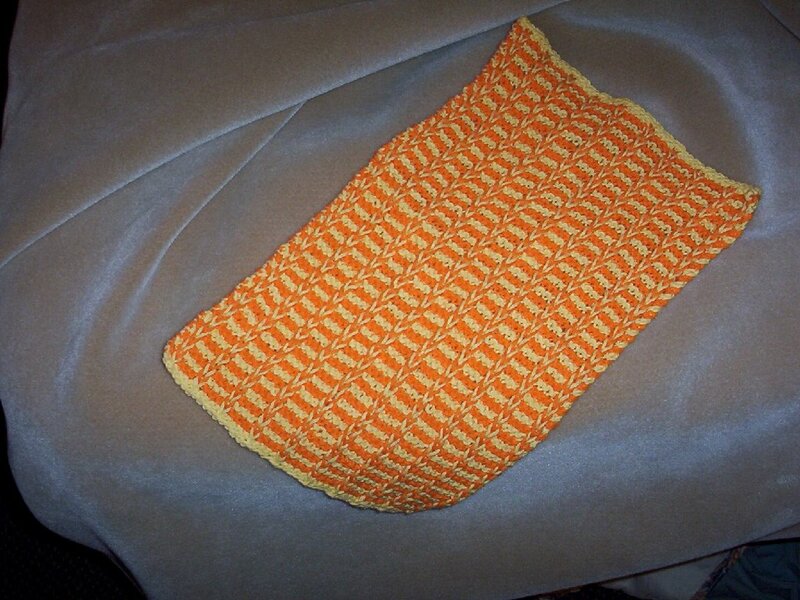 The yarn is Mandarine Naturelle cotton leftover from another project. 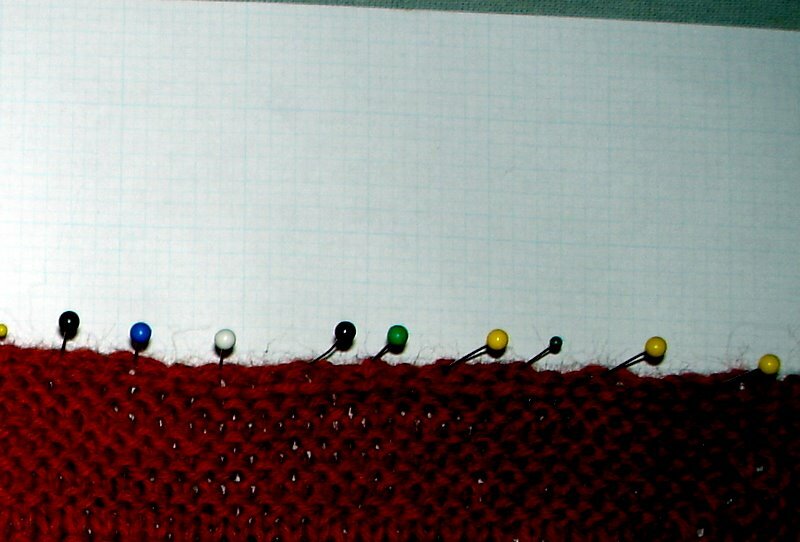 Size 6 needles. The squares are the smaller size (CO 48) and there are 56 of them. I used Kay's no-sew version so when it came time to sew them up I had 12 squares and four 1/2 square for the ends. I sewed them back to back (into a tube) so that it is reversible and added matching polymer clay buttons to keep it flat. I finished with an I-cord fringe. I just love it! Here is a picture of my five year old son wearing it and a picture of the front and back. This sure took awhile, but it's now complete and happily being put to use! Project details on my blog! See you there! SweetBeaker. 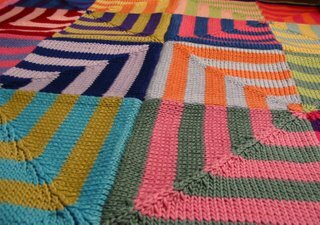 So after a last big push last night, I finished off my stripy burping blanket. 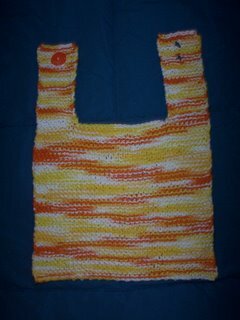 I managed to get it done with only a few "mistakes", but since it's striped, the extra ones look okay. :-D (Check out the two thicker blue stripes.) 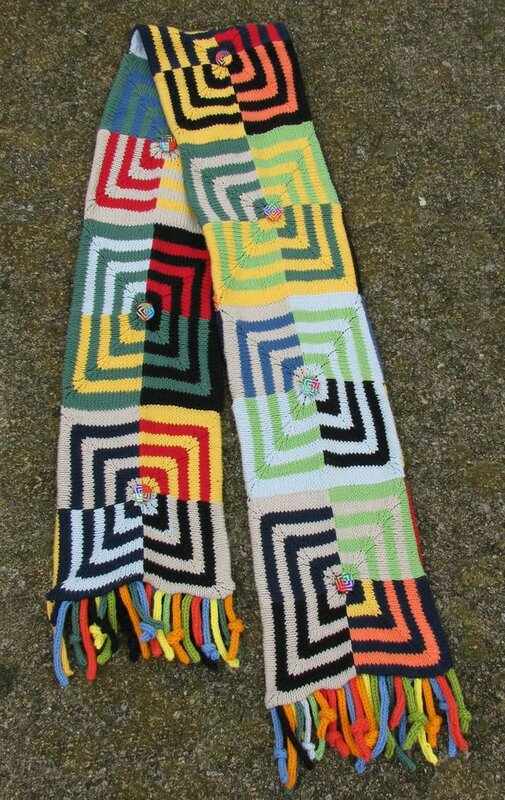 I did notice that the pattern says two rows per colour, but I think for future ones I'll be doing 4 rows, as I think it would look better. (IMHO of course) The lighter yarn is a cream with blue flecked Sugar n' Cream (I didn't keep the wrapper, so I'm not sure of the exact colour), and the straight blue is a denimy cotton yarn (I forget which brand). I'm quite pleased. 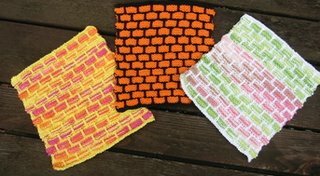 Here are some washrags that I made and sent to my in-laws as a housewarming gift. They wrapped up quite nicely. I used Lily Sugar 'n' Cream, because I have a hard time finding Peaches 'n' Creme in Indiana. More pictures are on my web site. 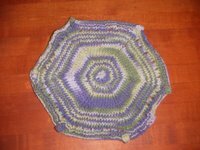 This is my first hexagonal washcloth - I started it earlier but it was my first DPN project so I put it down - last week, I frogged that & started from scratch again & it went by pretty well. I put markers for each section & I think that lessons the intimidation factor of the pattern - you know immediately if you messed up. It's made from Sugar n' Creme in I believe Midnight Magic I found at Meijer. 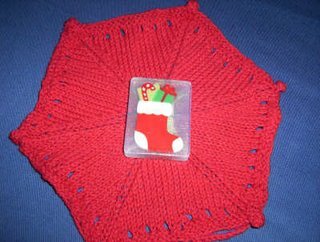 For people who've made these - how did you attach the crochet hook? My cast-on is not at a bobble, it's in the middle of a section and I feel like the hook should be on a bobble. Just in case you all don't have 27 balls of sugar & cream in your stash or you thought of 3 more people who you must make a gift for - Hobby Lobby comes to your aid in your hour of need! It's on sale again this week $0.99 for Sugar & Cream! Happy Knitting All! Finally I have something to show off again! 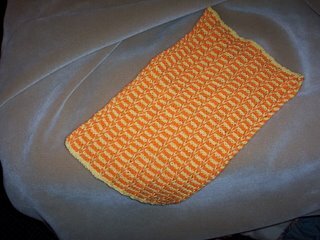 Here's my Moss Grid Hand towel. I got to kind of like the EuroFlax after a while. 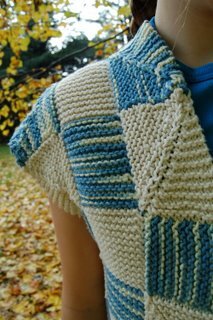 You can see a few more details in my blog as well as a completed bib that is a variation on the MD bib! hey all. 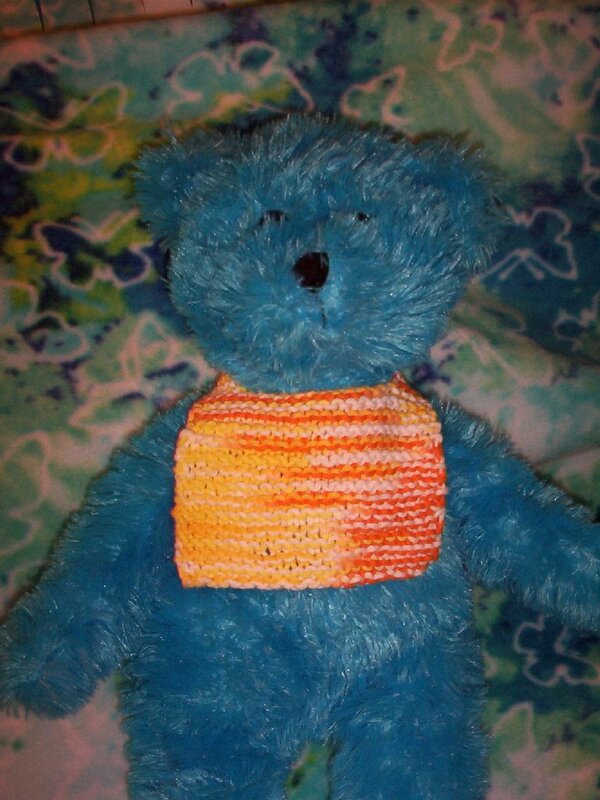 i was wondering if anyone one knew how to knit a ruffle onto the bottom of a bib to girlie it up a bit! thanks in advance! I am trying to knit Ann's Dishcloth as posted on www.bruxknit's.motime.com It is made up of alternating squares of embossed heart blocks and moss stitch. Row 15 ends the first set of blocks and the pattern then shows rows 16, 17 and 18. 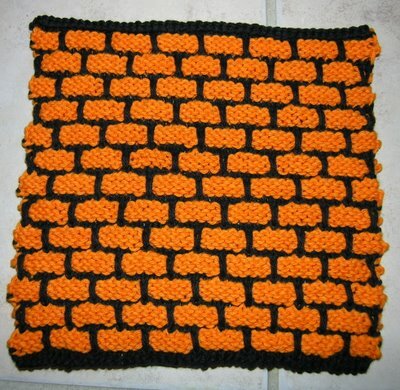 Then the pattern reads "continue in this way, alternating blocks of moss stitch and embossed hearts for a total of 60 rows." 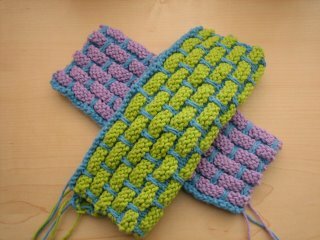 This is where I get in trouble...if I follow the pattern, as written, I am not alternating the squares and I'm having a heckava time trying to figure out what to do next. Can anyone help me with this....without making me feel like an idiot??????? I am a home today managing a mobile kitchen for a train derailment via telephone and radio. 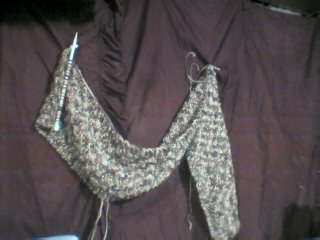 Well I had some chance to work on a scarf for Knitting for Charity. 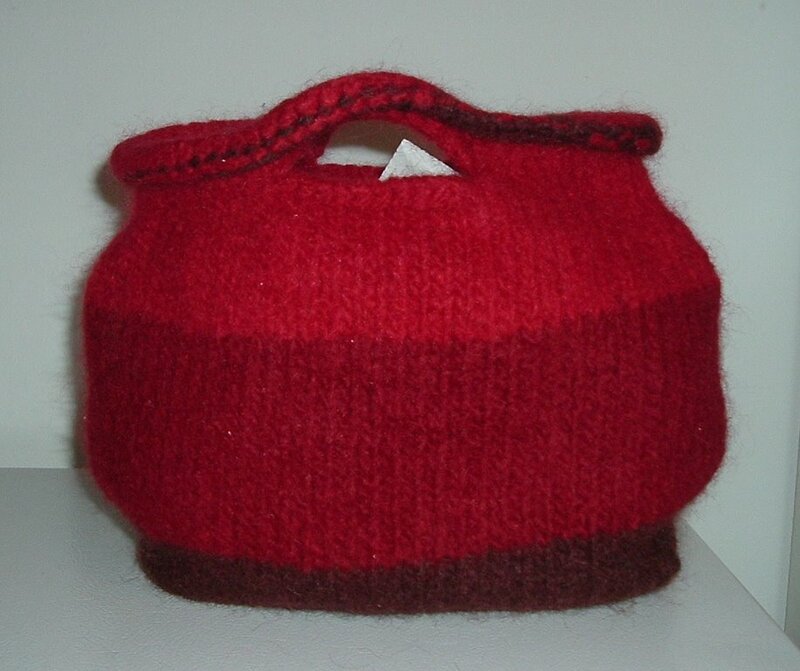 By the way I am looking for some pattern for hats in super bulky. I would like a couple just to knit a few. I am also looking for some old copy write free paterns to put in a booklet for Knitting for Charity in Pittsbrurgh. Well I am getting alot of knitting done today. Anyway, I've come up with a blocking technique that I hope other miter-heads will find useful. With the help of 10-squares-per-inch graph paper and a spray bottle, I've turned my ironing board into a blocking board. A real blocking board is probably in my future, but until then, this works a treat. Could you receive a cuter present? I'm still trying to decide what to make next...I want to do it all! The Log Cabin grows and grows. I was running out of the red and blue yarn that I had in the stash, but lucky me -- Elann just restocked both colors. So I'll keep right on going. It's so much fun to see everybody's projects. Give yourselves a big round of applause for all your great work! This is my second MD Felted Box. I was more careful about my crochet tension when I joined the sides and this box has a better shape. 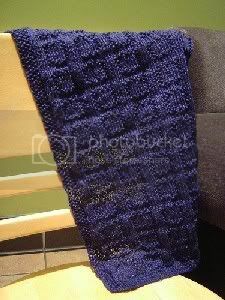 I used the better part of 2 skeins of Lamb's Pride Bulky in Aztec Turquoise and size 15 needle. The color is slightly off because it is still drying. I also made a pair of Ballbands using Sugar 'n Cream in Hot Blue and Hot Green. I had planned to put them in the matching box and give them to my daughter but she took them home before I got a picture. Guess that means she likes them! 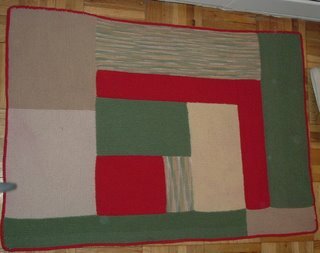 What are some good yarn suggestions for a log cabin blanket? 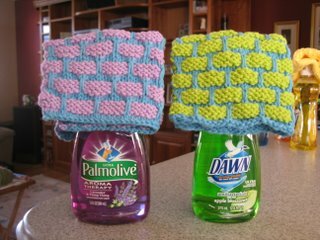 I would like to make one for MIL but it would see a lot of use and she generally doesn't read directions when it come to washing...cold water...hang dry. So, I am turning to the experts here! Suggestions? Here are three more Ball bands I have made, these are going to be stocking stuffers fore various family members. The Orange and Black is for Oregon State, not Halloween. It's one of my "manly" dischloths and is for my brother. I FINALLY tackled this pattern! 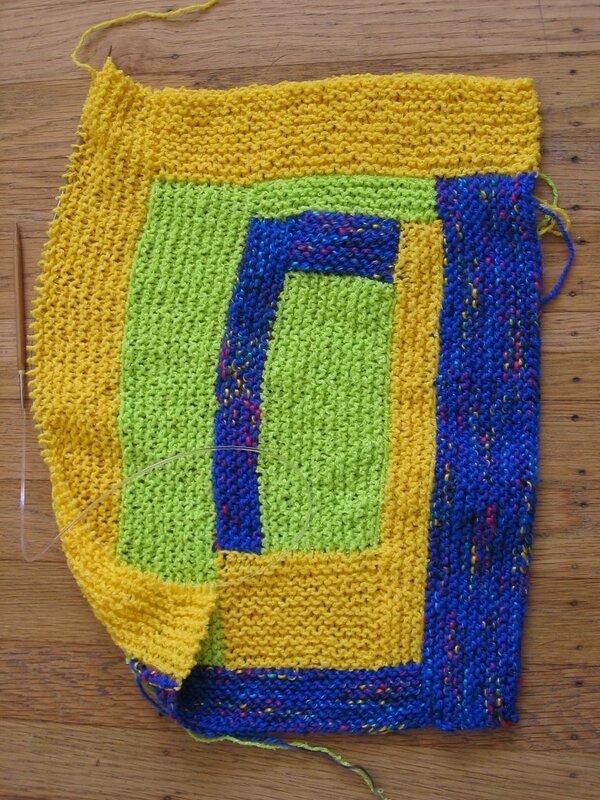 The first time I started it I CO too few stitches (that's what you get for talking while CO! ), the 2nd I messed up on the eyelet round (again, that's what you get for talking !) The 3rd time I used stitch markers after every 25 stitches & VOILA! Success! I think I like the solids better than the variagated but it does photograph nicely! Does everyone know about the big yarn sale at Michael's this week? Sorry to lead you into temptation, but the holidays are coming up, after all! Knitting in Mexico ....... Mason Dixon Style! Just returned from Mexico... knitting in the pool... it doesn't get any better!